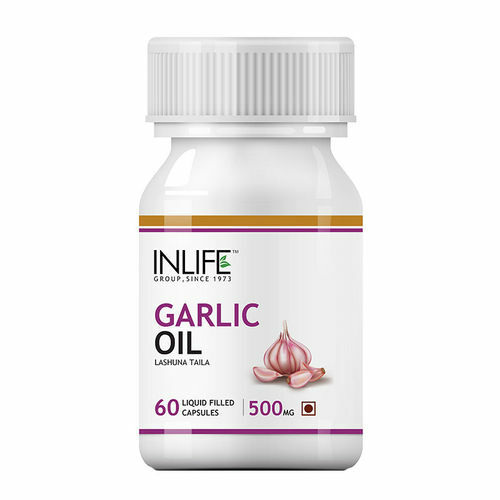 Inlife Garlic Oil is encapsulated in hard gelatine capsule(microbial resistant). This oil consists of Vitamin A, B, and C, Calcium, Protein, Sulfur, Potassium, Zinc and many others. Garlic has strong antioxidant properties and benefits preventing cells from becoming weak. It also prevents from cardiac disease. It helps to balance blood sugar levels in the body. Lowers cholesterol and triglycerides levels. Helps to fight against allergies. Resolves gastric problems and improves digestion.